I was served by michele and was cheerful and polite to me, the store was lovely and clean and I felt I came out with a bargain. It was my 1st time in the shop & 1st impression was that it was clean & tidy & well lit. You could see where to go for your required item. On passing the till area the young man welcomed me to the store. I said i was just going to look at the mens boots. I found the boots i required and said i would be back. On my return i was welcomed by the young lady and i went to the mens section where i found the boots i required. I found the size for me tried them on and was satisfied with them. 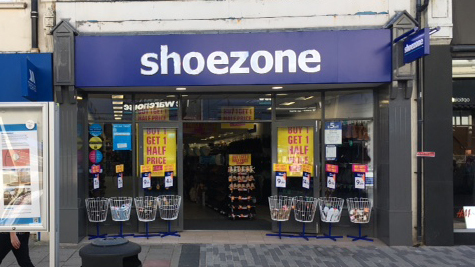 After paying for the boots the staff thanked me for shopping at Shoe Zone and wished me a good day, with which i thanked them. Over all the staff were friendly and courteous. I will recommend Shoe Zone to my friends for quality and good prices. Thank you all. Well located, easy to roam around and find the products. I am sorry to say that I was very disappointed with the service I received at the store today, when I approached the desk with my purchase the cashier COLL was in conversation with another member of staff, I said good morning and was totally ignored by her, she gave me no eye contact while serving me and continued her conversation during the transaction, not at any point did she smile or acknowledge me in any way. At the end of the transaction I said thank you and once again she did not reply, at no point did she look at me or show any interest in the fact I had just bought a pair of shoes from the shop. I work in customer service myself and I was appalled at the lack of interest and courtesy during my purchase. I will not be returning to Shoe Zone in the near future and I suggest that COLL takes a customer care course. Items marked average as I was not looking for footwear on this visit, so please do not be offended as I found what I was looking for when all other footwear shops no longer stocked this item, please do not stop with the wooden suede brush as my husband uses this in his job as it is both hard enough without being damaging to the items he cleans with it. I called into your Worthing store this morning as I had a problem with a pair of boots I purchased a couple of weeks ago - I did not have the receipt. I explained the problem to Emily and without hesitation she exchanged the boots for a new pair. I was really impressed with her reaction and resolution to my problem and I will definitely continue to shop with yourselves.